On the podcast this week I share lots of great tips and advice for repurposing video content. 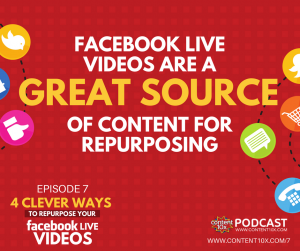 Specifically, I focus on how you can repurpose Facebook Live video. Interestingly, I’m not focussing on how you can turn video into different formats e.g. written articles, graphics…etc. Instead, I look at how you can turn one video into many videos. 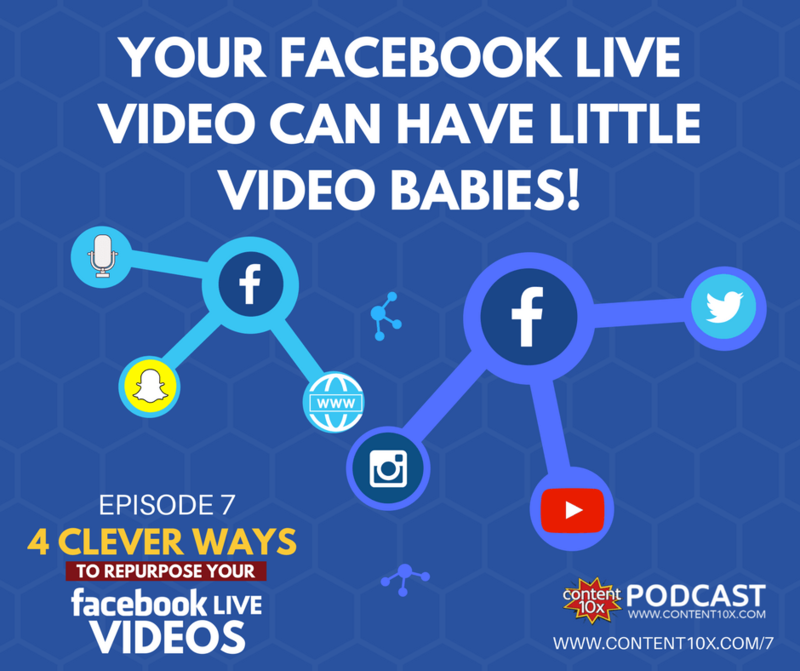 Basically, let’s see how your Facebook Live video can have little video babies! Live video is hot right now. When I was at Social Media Marketing World in San Diego in March it was a huge focus, brought up in almost all of the keynote talks. The long and short of it is that people love to watch, interact with, and share Facebook Live videos… and so in turn Facebook LOVE live video. Mark Zuckerberg has stated on more than one occasion that he sees live video as the future of Facebook. Facebook have announced that they see 10 times more engagement on their Facebook Live videos than their regular videos. Why do we like live video? Is it the suspense…anything can happen?! Is it the ability to interact with the presenter in real time…ask questions, comment? I think a huge part of it is that it is raw, real and shows the human side of people. Going live is not for everyone. But, for all the reasons mentioned above, I really recommend giving it a go. 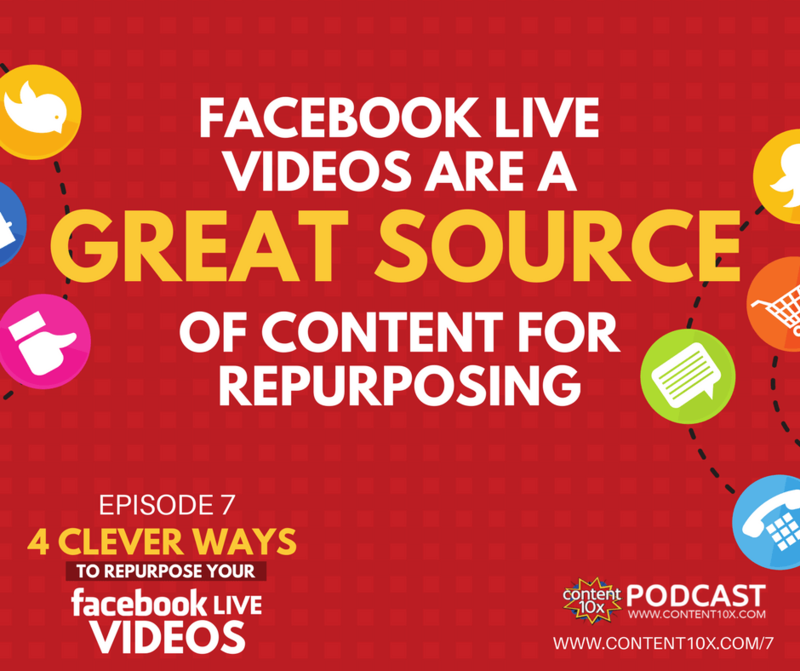 Your Facebook live video will then provide a great source of video content for repurposing. 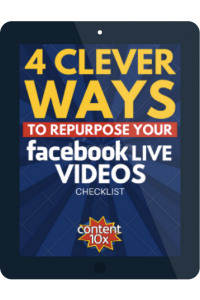 I'm going to share four clever ways that you can repurpose your Facebook Live video to make it go further. 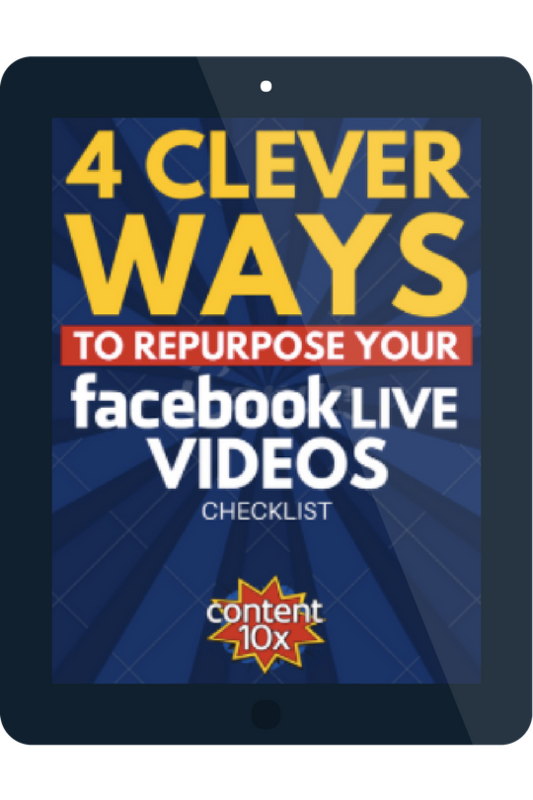 When you've recorded your Facebook Live video, the first thing that you need to do is extract/download the video file so that you have something to work with for repurposing. Warning: Facebook change things more than David Beckham changes his haircut, whilst this is correct at the moment of writing, apologies if it’s not anymore! 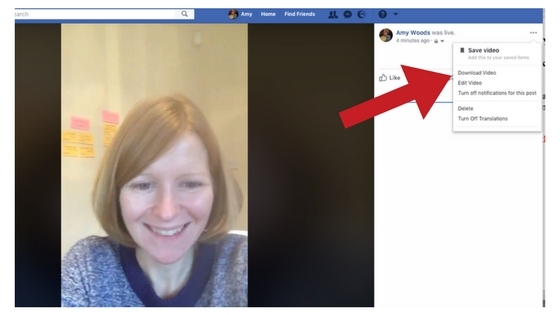 Whether you recorded a Facebook Live video from your profile or your page, you firstly need to ensure you save the video at the end (you are asked if you want to post it or delete it and you want to post it). Then, go to your videos. You will see your video there and when go into it you will see three little dots to the top right hand side. Clicking on that will give you download options. For Apple lovers like me…If you record the video from your iPhone, you can easily send the video file to your Mac via AirDrop…et voila! TIP: When you are downloading your video file you may want to check that you're happy with the title/information related to the video in Facebook. You can add tags and a custom thumbnail. See image below. 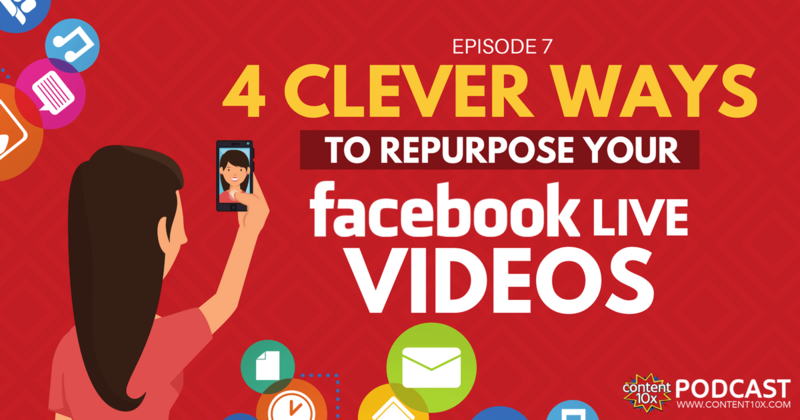 What are the 4 ways you can repurpose your Facebook Live video…whilst still being a video? 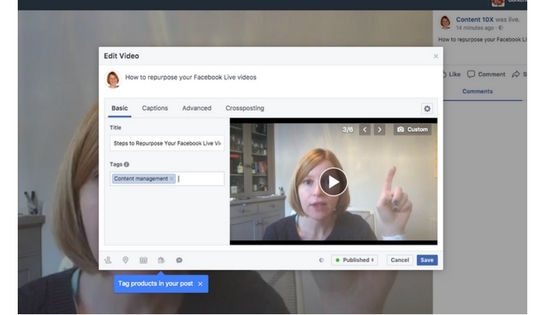 Now that you have a video file of your Facebook Live recording, why not go and publish it on YouTube too? YouTube is the second most popular search engine after Google…and it’s owned by Google (so Google return a lot of YouTube content in their search results). I recommend that you edit your video first before you put it onto YouTube. Just make sure that you remove anything that is not relevant or interesting for a non-live audience, e.g. they really don’t want to wait for people to join! Either DIY edit using software live iMovie or Windows Movie Maker or whatever video editing software you prefer. Or, outsource the video editing to someone in your team or a freelancer. Your Facebook Live video does not need to live on Facebook. You have completed #1 above and edited the video for a non-live audience. Now, why not publish the video onto your website? Uploading the mp4 file to your website would likely be a bad idea, as it will be large in size and potentially slow your site down. What you want to do instead is stream it to your site from YouTube (or, if you prefer, from Vimeo, Wistia…). If you followed the first step above, then this is a breeze for you. I recorded a Facebook Live video about this blog and podcast episode, edited it, put it onto YouTube, and here it is on my website...(no-one can ever say I don't practice what I preach!). Edit your video into really short clips, for example 15-30 second clips, and then share them on Instagram. You can share as an Instagram post (up to 60 seconds) and an Instagram Story (up to 15 seconds). You can also share these short little videos on Snapchat and Twitter as well…and in fact you can share back on Facebook as a post or in Facebook Stories. And a fun thing that you can do is you can make your videos even more engaging for audiences by using the Snapchat and Instagram Stories filters/effects. Then, you can use your fun video that’s had a few effects added and share further. For example, add effects on Snapchat then share that video on Facebook, Instagram and Twitter. Instead of breaking your video down into short little clips, are there ways that you can edit together short videos into longer videos. This won't work for every type of video of course, but there are certainly many videos that you may have recorded that would be ideal to bring together. A collection of some really great, really high-value Facebook Lives that have been edited together can look really good if done well. For example, if you have a membership site or an online course, there may be material that you have recorded that come come together to form a learning module or an FAQ video. Or, you could create an advert, or a video for live events. This is something that you could DIY using video editing software, or you may need to hire a video editor to help you out. Or, of course, get in touch with us at Content 10x for any of your content repurposing needs! That’s four clever little ideas for making your Facebook Live videos go further... or as I put it earlier, have little video babies! !